This guest post was written by Kayla Mackie of the Consumer Safety Organization. She approached me about doing a piece on the safety of our cosmetics. I quickly agreed. It’s almost been 80 years since the FDA’s regulatory authority for cosmetics has been updated. How alarming is that? While Canada and the European Union have banned the use of over 1,000 ingredients found in cosmetics, the United States has banned only 11. Every day, millions of women around the world go about their daily beauty routine not knowing that the products they’re using could potentially harm them. Beauty products today can eliminate wrinkles, sculpt cheekbones, and enhance your eyelashes. But many of these powders, moisturizers, shampoos, and shaving creams are filled with toxins that our bodies should not be absorbing. You can refer to the makeup safety guide from ConsumerSafety.org below for more details. Considering our skin is our largest organ, it’s really important that we know what we are putting on it. For example, some eye shadows, bronzers, blush, lip balms and body powders contain talc, which is linked to a higher risk of ovarian cancer. While this connection has been known for decades, it wasn’t until last year that juries began recognizing the dangers. Don’t freak out just yet - not all beauty products are harmful! There are alternatives to those that are. Beauty Counter is a great company for safer alternatives. Another way to ensure you are using clean beauty products would be to create your own DIY products. 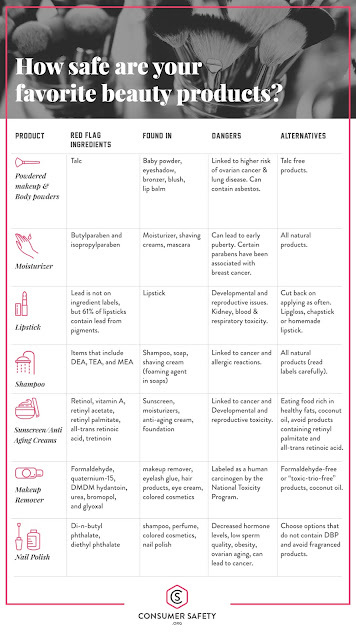 To limit the risk that some beauty products pose, know what to look for. Ingredients in beauty products are not usually on the packaging, so using the makeup safety guide above would be a quick and easy way to tell if the products you use contain any harmful toxins. Most important of all, be educated about what you are putting on your body, in your body and around your family.